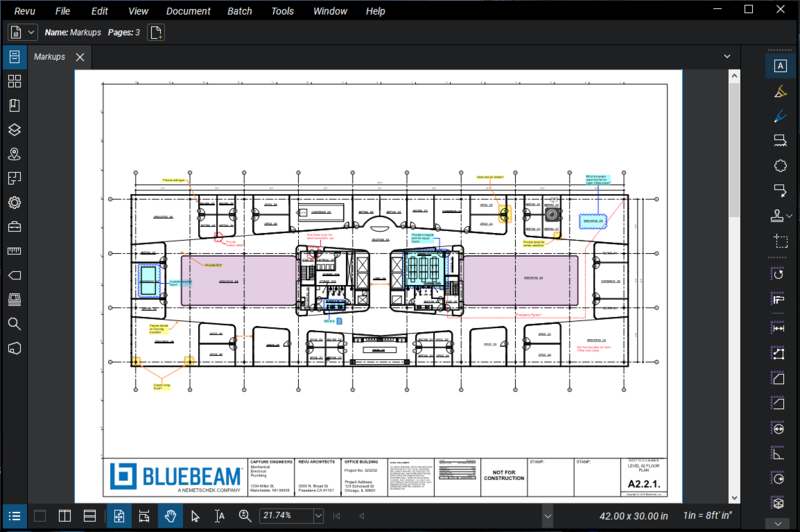 Bluebeam Revu 2018 | Standard | CAD | eXtreme - Taradigm, Inc. Many organizations have realized the benefits of Bluebeam, however managing installations, licenses, and versions can be frustrating and confusing. We offer a complimentary, no hassle review of your Bluebeam deployment to ensure that you are taking advantage of all available opportunities that come with proper license management. Required: Required: Yes, I'd like Taradigm to review my device and license report and provide available options to optimize my Bluebeam license deployment. Once we have reviewed your license and device installation report we will put together a list of options for your consideration. Convert an unlimited number of Microsoft® Oﬃce documents and CAD drawings into high-quality 2D or 3D PDFs, or transform scanned images into text-searchable documents. Make large drawing sets more manageable by creating smart documents that can be shared easily with project partners—in the oﬃce or in the ﬁeld. Revu comes with powerful document management and real-time collaboration features. Studio Projects give you a single centralized location to store documents—even entire building projects—in the cloud. And Studio Sessions let project teams review, mark up, modify and update the same ﬁles at the same time. So partners worldwide can instantly connect on the same set of documents. As part of the installation, the Microsoft® .NET Framework 4.6.1 will be installed if .NET 4.6.1 or higher does not already exist on the workstation. Bluebeam Revu is certified Citrix Ready® for XenApp® 6.5-7.6 and XenDesktop® 7-7.6. Note that Windows Server® 2008 R2 and newer are supported under Citrix environments. Perpetual Licensing is a licensing system that requires companies to purchase and register Revu on a per workstation basis using a serial number and product key. Perpetual licensing is available for Revu Standard, CAD and eXtreme and may include Maintenance. Open Licensing is an annual subscription that allows companies to authorize concurrent access to Revu eXtreme for any user in their company from a shared pool of seats. Open Licensing brings flexibility and the benefits of volume software licensing to organizations of all sizes, anytime, anywhere. Seats may be added to an existing Open License at any time, and they will be prorated based on the renewal date. Active subscriptions are entitled to free upgrades and Maintenance, with access to our Technical Support team by phone and email. What are the Administrator capabilities for Open Licensing? For situations when connectivity to the internet becomes temporarily unavailable, or if a computer is outside of the office and cannot connect, Open License seats will switch to offline mode. In offline mode, each device is granted three days to use the program before it is required to connect back to the Bluebeam Gateway. Administrators have the option to log in to the Gateway and manually release any user whose status is inactive. If the Administrator releases a seat while a user is working in the program, we release the seat but also protect the active user by allowing them to continue working so that they will not lose their work. Only when they close and reopen Revu again will they need an available Open License seat to continue working with Revu. How does Enterprise Licensing work? Automatically releases registered computers that have failed to communicate with our licensing server for 15 days. In other words, once a machine takes up a seat by registering to an Enterprise License, it will periodically ping Bluebeam’s Licensing Server to confirm that it is still active. If the machine fails to communicate with the server for a period of 15 days, it will automatically be released from the license key, freeing up the seat to be registered to another machine. The 5% overage, or cushion, allows for the lag time between re-imaging workstations or releasing inactive seats. If you exceed the overage allowance, an “exceeded licenses” warning will appear, and further installations will be restricted. The benefit of Enterprise Licensing is that there is no longer a need to manually uninstall or release seats from workstations that are being transferred, phased out or re-imaged. This Enterprise Licensing option takes care of that for you, ensuring that your licensed seats are fully utilized. Plus, because it is managed with Bluebeam servers, there is no need to install or maintain anything locally. What are the Administrator capabilities for Enterprise Licensing? How do I know if I have used all my licenses? Is there a charge for going over? With an Enterprise License, you gain access to the Bluebeam Gateway, a web portal for viewing and managing both Enterprise and Open Licenses. The Bluebeam Gateway allows you to view how many seats of each version and edition you own, how many computers, or “seats,” are registered to each license, and which computers they are. As long as your total number of registered machines per edition does not exceed the total number of seats allowed plus the 5% overage allowance, you are good! If you are approaching or exceeding your limit, you can purchase additional seats or unregister licenses from computers as needed. Any new seats purchased may take up to 24 hours to update and appear in the Gateway. There are a couple requirements for Enterprise Licensing. First, your licenses must be consolidated into a single license key by product. Second, your annual Maintenance must be current and maintained. Please note, Enterprise Licenses are not intended for Citrix or other terminal server environments. How much does Enterprise Licensing cost and how can I find out more?